Nursing students can easily choose a nursing degree path to fit their specific skills and interests. Nursing careers come in a lot of shapes and sizes. Decide what kind of nurse you want to be, then pick a school that will put you on your path to success. For a profession that offers a lot of variety and flexibility, it's only natural that training programs in nursing also provide many options to choose from. You don't need to change your whole life to make it through nursing school. With a bit of research and planning, you can find a program that fits well into your lifestyle. 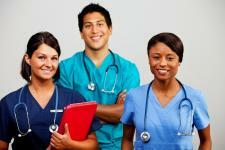 There are several factors to consider when choosing a nursing school. Do you want to live on campus and experience all of the traditional college life? Maybe you only want to take nursing classes during the nights or weekends? Have you considered earning your nursing degree online, so you can set your own hours? The nursing schools listed below will give you a range of options. But don't take our word for it – ask the schools directly! All of these schools will send you complimentary information. Just click on a nursing school below and learn more today. Though nursing is a very popular career in high-demand, nursing is not the only red-hot healthcare job out there. The medical assistant career is one of the fastest-growing careers in America. Like nursing, medical assisting gives you the chance to work hands-on with patients.